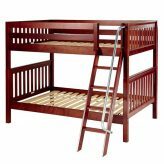 Full full wood bunk beds will sleep four people easily. If younger children are in the mix, you may even be able to sleep more. 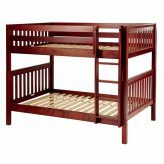 We have the standard full over full wood bunk beds but we also have L-Shaped and Parallel full size wooden bunk beds. So depending on the room size, you may prefer one of the less common configurations. Available in a variety of finishes, ladder choices, and heights, there is a bed that will meet your needs. Add play curtains & top tents to your full over full wood bunk beds. 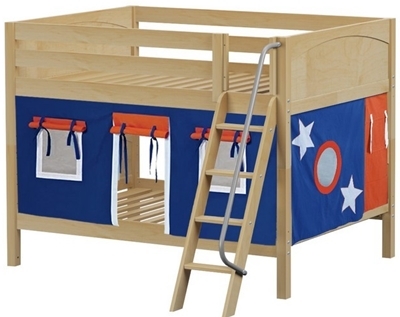 You can start with a basic bunk bed and add play curtains or a top tent for fun. Matching pieces of kids furniture are available as well as under bed drawers or a trundle. Added safety feature such as full length guardrails, wide rungs on ladders, a handrail on the angled ladders all added to the safety of these full full bunk beds. Sleep four with full over full wood bunk beds.